Hi, I'm Tim Timpsonson and I've a great opportunity for you today. Here's the idea: you know how it's nice to have salty snacks with your beer beverage? And you know how it's nice to have a biscuit with your tea? Yep. 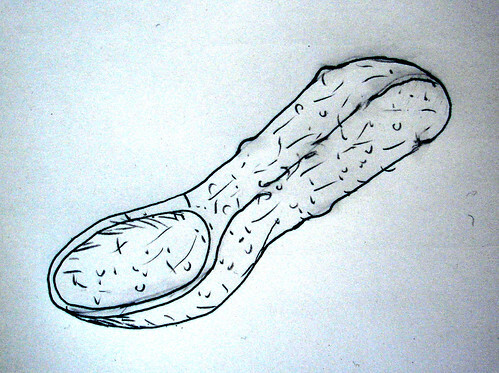 I know: you're thinking it's a knobbly spoon. No, sir it is not. Not at all. Well, taste it: I think you'll happily agree then that it's nothing like a dog biscuit. Now, imagine you're on a night out with the guys. You're drinking beer, catching up, telling the old stories. You want something to go with it - something more than a mere bag of crisps or nuts, but you don't want to bother with a full bar meal. This product is the BISCUIT MEATSPOON FOR BEER. Yes, a meaty dipping biscuit spoon for beer. Dip it in your lager like a biscuit, or if you're in an up-market bar you can use it to politely and delicately spoon the beer into your mouth. Or you can just eat it without beer! Personally, I like it with a Becks after a long day at the office. Our master meat brewer and her colleague the maestro di biscotti are very proud of what they've achieved. It has these proteiny nodules and rich seams of flavour in a layered matrix of bonded rusk biscuit. That ensures that the flavour is delivered in a quality-controlled manner throughout the course of your beverage, and the biscuit doesn't crumble or get soggy and dissolve in the glass - cloudy beer is the last thing you'd want, ha ha! Yeah, it's made out of various salty meats - I have the list here. Basically this is value-added snack consumption for the discerning, time-poor quaffer. It's a winner. So, this is a high-margin consumable retailed out of the pub-hotel-gaming-leisure industry. It's tasty and healthy, so you're going to feel good eating it. It's salty, so it's going to catalyse beer beverage sales. Here's the deal: I'm looking for 15 million to develop the product and marketing for a launch across Northern Europe. The market for meat and biscuit snacks is 800-1,200 million annually, growing 10% year on year. We'll get 10-15% of that within three years, and the margins, as you see from the charts here, are as healthy as the snack! Well, we're in talks with M&B and the other big names in licensed and leisure obviously, but no, nothing on paper yet. Oh yes. Further down the line we'd add value packs and so on. And broaden the range: we'd add a vegetarian option. And a darker, more rustic ale/stout variant alongside the vanilla flavour targeted at lager/pilsner drinkers. Not that it's vanilla, ha ha, no. At this point the door closed, and I couldn't hear any more from the outer office. I don't know if the pitch was successful, but did later see a venture capitalist emerge from the boardroom patting his stomach, a few crumbs falling from his three-piece. The above is the output of the small hours, when insomnia visits with her spiky fingers. Dragon's Den. Double dare you. Lets face it Dragons Den is the way forward here. It can't be any more harmful than a pepperami standard or extra hot, and I for one would invest £5 for 84% of your company. I've heard of this before, only now do I know how you'd make it... Salt Licks are used for cattle etc to provide extra minerals for there diet. I have seem them in the real! It's hard compact stuff, and last ages... Cows tongue is rough like sandpaper. So you'd need to male the spoon from this stuff. I'm interested in developing this product! ... and by dog-leg accountancy practices.